The Road Goes Ever On, also known as The Old Walking Song, is a poetic verse sung by Bilbo Baggins at various points throughout The Hobbit and The Lord of the Rings. Versions of the song were used in the 1977 animated movie of The Hobbit as well as the 1981 BBC radio version. It was later adapted for the 2001 theatrical release of The Lord of the Rings: The Followship of the Ring. This comic book homage, also based on the original writings of J.R.R. 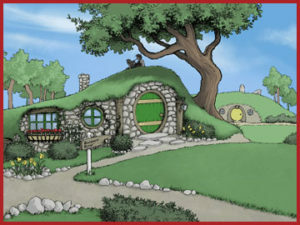 Tolkien, is a panoramic tour of The Shire. Read the lyrics, relax, and watch the seasons pass – spring to summer, autumn to winter. There and back again. Please note: this comic is not for profit and not affiliated with The Hobbit, The Lord of the Rings or the Tolkien estate.